This week we celebrate the beginning of the holiday season with a performance by the immutable and effervescent band leader, singer, composter, pianist James Jozee & Gogosimo Band. Check out his profile below. We want to let all our fans and community know that this will be the final concert of 2018 and join us again on January 10th 2019 as we get back to doing what we do best, presenting the best of Acoustic, Jazz, Fusion and Roots Music by Kenya and East Africa’s best artsts. Happy Musical Holidays to all of you. 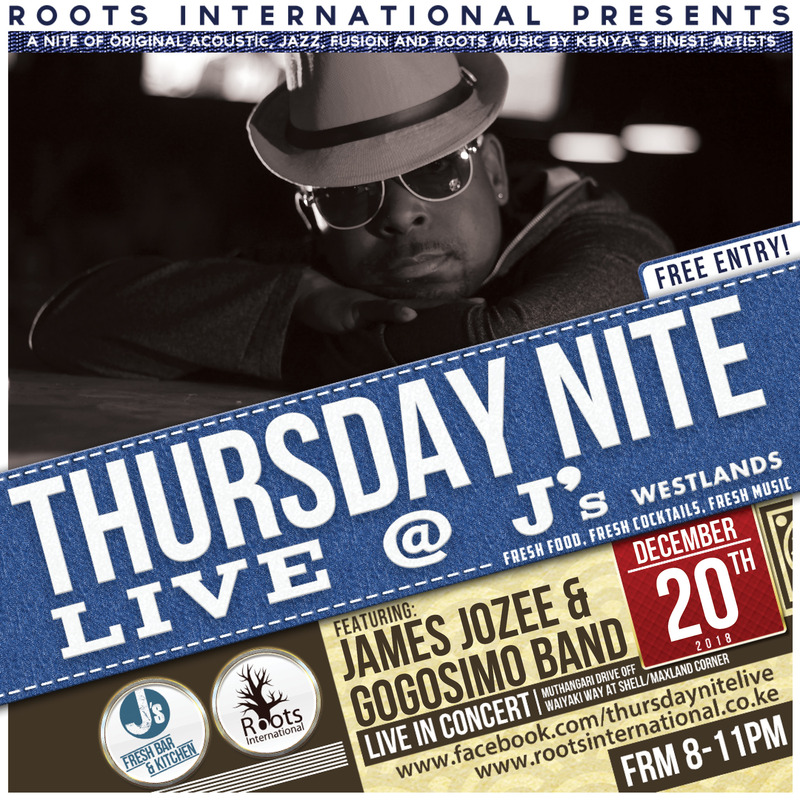 Marcus James Jozee, known as James Gogo is a multi talented musician and vocalist. James, of Congolese, French and Kenyan heritage, was raised in the coastal town of Mombasa, Kenya. His late father was a Jazz Saxophone player back in the days and it was he who introduced James to music at a tender age. Music became his passion, starting with saxophone, then drums, piano and finally he majored in classical piano. Apart form his father, his inspiration comes from Stevie Wonder, Oscar Patterson and Mzee Ngala. He has thrilled audiences with his distinctive, playful and magical vocals and sound on the keyboard. In 2000, he was a pianist in a band named Safari Sounds, and in 2002 he started a duo singing group and his own seven piece band named Gogosimo. James is the lead vocalist, composer, lyricist, producer and director of Gogosimo. James’s music is danceable Afro pop & fusion ,it is music that is a rich blend of coastal music, African beats and western instrumentation creating a unique East African sound. He also performs conversions of different genres of music from soul,jazz,rhumba,salsa, afro-beat,funk,pop and soft rock.